Rraneffa shares a new land - and her heart - with Esarrali. So Many, Many Frogs (1520.03.21): Rraneffa tries to tempt Esarrali from her slow, meticulous study of The Waterfalls' many frogs, but it takes something more to distract her. 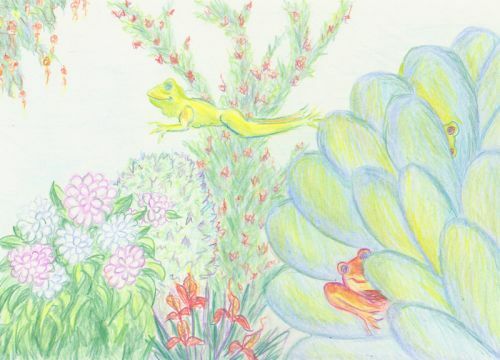 Rraneffa is bitten by a poisonous snake, and Esarrali has to search through a metaphorical haystack of frogs to find the one that can save Rraneffa's life. Lizard, Lizard (1520.03.26): All trips must come to an end, and Esarrali coming to her last notebook signals the end of her research at The Waterfalls. Rraneffa decides to cook some "araterl" lizards for dinner, but things don't go quite as planned.